As much as the Jets insisted throughout training camp and the pre-season that there was no quarterback controversy ("Mark is our starting quarterback") is it possible they were telling the truth? Did the Jets decide sometime a few weeks ago that Tim Tebow was actually going to be exclusively a running back/Wildcat coordinator/football player at-large instead of seriously threatening Mark Sanchez's job? [By] the end of the first week in Cortland it was clear that the whole thing was really a MacGuffin. As soon as Sanchez watched Tebow play, Holmes told me, "it allowed Mark to relax. He sees Tim Tebow has no qualities he does. He sees he can be a great teammate and football player, but not the same kind of quarterback. All he can do is line up and play football. Run, score a few touchdowns, and the people love me! Don't expect slants or curls, just expect football from Tim Tebow." As a college coach, Schottenheimer attended the Bills' training camp during the 1999 Doug Flutie—Rob Johnson faceoff, and says, "It was flammable." 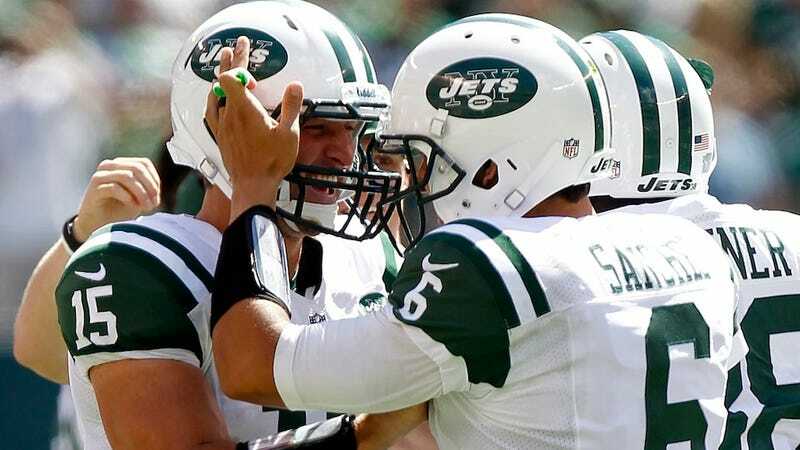 The overheated summer that the Jets created by trading for Tebow was something different. They seemed to be asking one young quarterback to help another grow up faster. Much that Tebow did failed Ryan's standards for proper form. Tebow wound up before he threw, he made his lateral cuts off the wrong foot, he put himself in harm's way too often. "The thing you can't measure is a damn heart," Ryan said. "Guy's a winner. You sense it when you're on the field, how excited everybody is about it." Then he looked at Tannenbaum and joked, "Don't take it personal when you start getting death threats for not playing him, because I'll be putting it on you!"